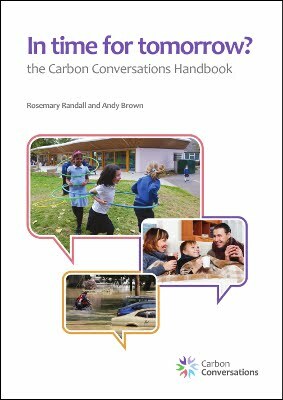 Carbon Conversations offers a facilitated, supportive group experience which helps people halve their individual carbon footprint. The project ran actively for ten years between 2006 and 2016. Baldernock Cut the Carbon, Bedford Climate Change Forum, BioRegional, Brighton Peace and Environment Centre , CAG Oxfordshire, Callander and Climate Change, Cambridge Carbon Footprint, Carbon Literacy Forum, Carluke Development Trust, Comrie Development Trust, Conversations Carbone, Eco-promotion, Going Carbon Neutral Stirling, GreenTEA, Himalayan Centre , Histon and Impington Climate Action, Iona Community, Job Force Wales, Keep Scotland Beautiful, Leeds for Change , Lincon University, Low Carbon Communities, Low Carbon Hub, Low Carbon Oxford North, New Caledonian Woodland, PLANED, Portobello Transition Town, South East London Community Energy, South Wilts Agenda 21, Talking Climate, The Surefoot Effect , Transition Edinburgh South, Transition Edinburgh University, Transition Norwich, Transition Peterborough, Transition Primrose Hill, Transition Scotland, Transition Stirling , Transition Town Tooting, Transition University of St. Andrews, Tweed Green, Urban Roots. Groups are still being run in the UK and groups are also being developed in Australia, Canada, the US, the Netherlands, Switzerland, Spain and Lithuania. If we have missed you, or you would like another name or link, add a comment below or and I will update the list. As it is no longer being actively managed, we have created this site, where you can use and download all the materials that were created for it.